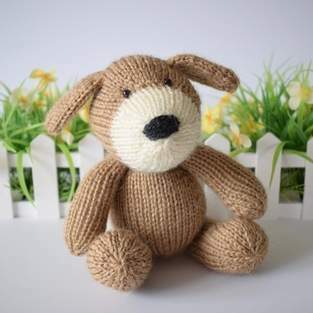 Mortimer is a cuddly little puppy, and knitted in soft and fluffy alpaca yarn. TECHNIQUES: All pieces are knitted flat on straight knitting needles. You will need to cast on and off, knit, purl, work increases and decreases, change colours at the ends of a row (knit stripes) and sew seams. FINISHED SIZE: The puppy is approximately 21cm tall.